Scientists exploring a remote riverbank on Alaska’s North Slope have made a surprising find — the discovery of the northernmost species of dinosaur ever found — and it’s just one of what may turn out to many more to come. The researchers uncovered several young specimens of the dinosaur while investigating the Liscomb Bone Bed, a stretch of ancient sediments some 480 kilometers [300 miles] north of Fairbanks. The bed holds a trove of animal fossils, the researchers said, including at least 13 species of dinosaurs, along with fish, birds, and small mammals. “What we’re finding is basically this lost world of dinosaurs with many new forms completely new to science,” said Gregory Erickson, a paleobiologist at Florida State University, in a press statement. The new dinosaur find stems from the bed’s most abundant group of specimens so far: thousands of fossil bones belonging to a herd of young plant-eating dinosaurs that met a sudden, untimely demise some 69 million years ago. The animals represent a new species of hadrosaur — a type of large duck-billed dinosaur — that lived well above the Arctic Circle, even farther north than where the bone bed sits today. “Today we find [the fossils of] these animals in polar latitudes,” said Dr. Pat Druckenmiller, a paleontologist with the University of Alaska Museum of the North. “Amazingly, they lived even farther north during the Cretaceous Period. In the Late Cretaceous, the global climate was considerably warmer, likely due to widespread volcanic activity. As a result, the poles were forested rather than ice-covered. But the dinosaurs still lived in a surprisingly cold environment, with average temperatures around 6 Celsius [43 degrees Fahrenheit], and they were likely no strangers to snow, researchers say. In addition, the Arctic dinosaurs endured months-long stretches of darkness — raising questions about how they adapted to survive in such conditions. “The finding of dinosaurs this far north challenges everything we thought about a dinosaur’s physiology,” Erickson said. 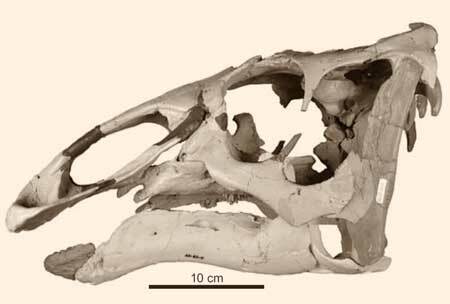 The team gave the new genus of dinosaur the name Ugrunaaluk, meaning “ancient grazer” in Inupiaq, the language of the North Slope’s native population. “It appears that a herd of young animals was killed suddenly, wiping out mostly one similar-aged population to create this deposit,” Druckenmiller said. 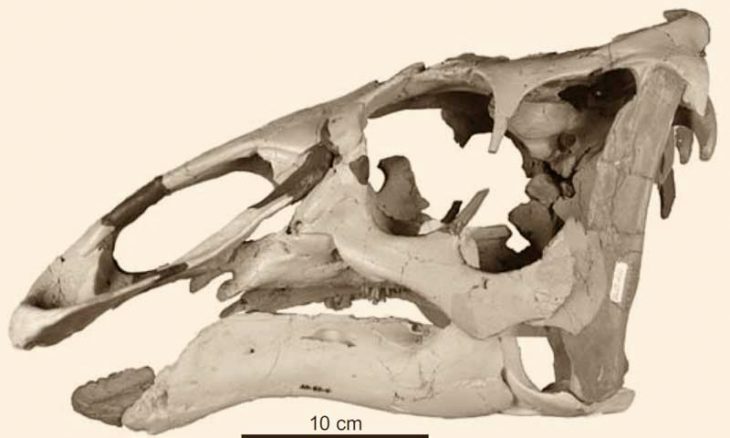 “Because many of the bones from our Alaskan species were from younger individuals, a challenge of this study was figuring out if the differences with other hadrosaurs were just because they were young, or if they were really a different species,” he added. The wealth of fossil data related to this new species — totaling 6,000 bones in all — has made it the most well-documented Arctic dinosaur on the books. “[This] is far and away the most complete dinosaur yet found in the Arctic or any polar region,” Druckenmiller said. But the Alaska specimens turned out to have an array of unique characteristics, mostly in the skull, including unusual features around the eye sockets and what Erickson described as “batteries” of 1,400 teeth, well-suited for grinding up coarse greenery. “The new species has a unique combination of characteristics not seen in other dinosaurs,” said former Alaska graduate student Hirotsugu Mori, who did his doctoral work on the newly described dinosaur. Although its far-northern range may seem unlikely, Ugrunaaluk is by no means the only dinosaur species known to have lived in the Arctic. Just like the tyrannosaur, Ugrunaaluk demonstrates that Arctic dinosaurs may have resembled, and lived at the same time as, similar species farther south, but the northern animals were uniquely adapted to their high-latitude lives. “The recognition of Ugrunaaluk provides further evidence that the dinosaurs living in polar latitudes in what is now Alaska were not the same species found from the same time periods in lower latitudes,” Druckenmiller said. Now, the researchers are continuing to explore and excavate the Liscomb Bone Bed, pursuing more signs of dinosaurs and ancient life near the top of the world. 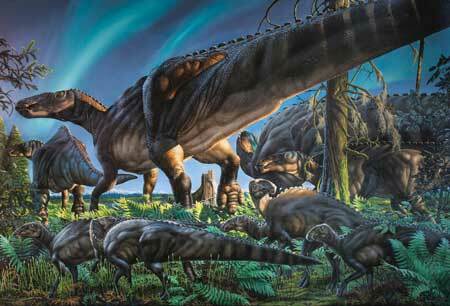 “There’s a whole different province of dinosaurs up there,” McCormick said. The researchers report their findings in the journal Acta Palaeontologica Polonica. Maybe feathers evolved first as insulation for polar dinosaurs, and then later, specialized feathers led to flight.